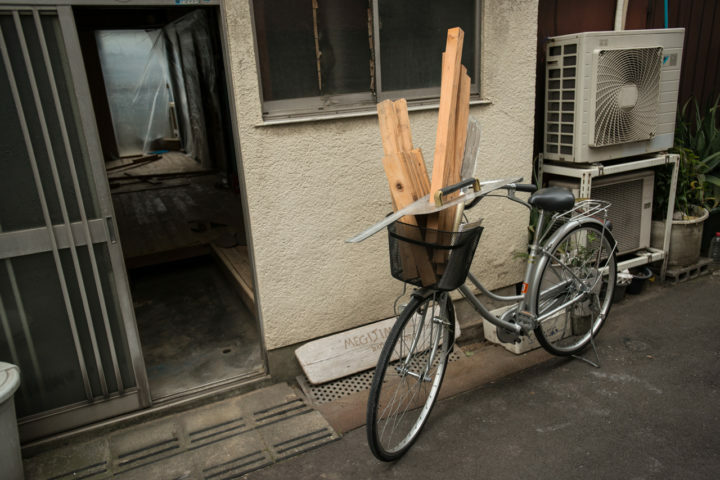 It’s a brisk Winter morning in Osaka, and I’m jumping on a bike, headed to a warehouse down the street that is filled with used wood. A saw, square, a notebook with some scribbles and measurements, and a few other tools are in the bike’s basket. The building we are working on renovating is completely bare. 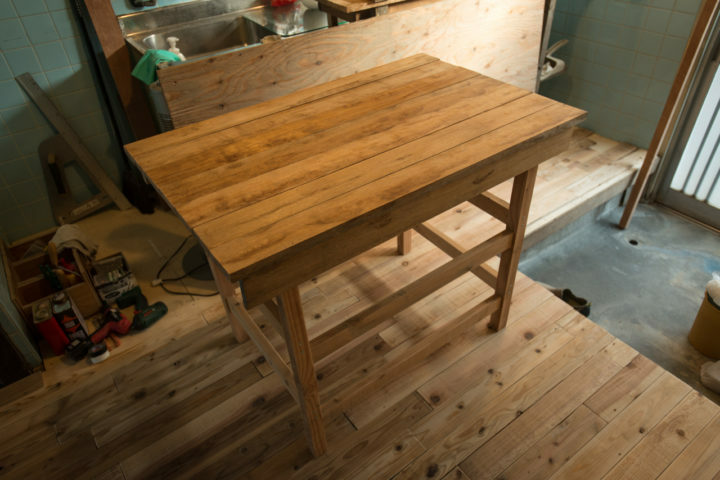 Last week the first job in my head was to hunt down wood to cut and lay a floor, and with that job basically done, my aim today is to build another of the most basic of things a house should have, a table. Later, when my partner Suhee arrives to Osaka, I’ll get to the more intense things, like ripping away walls. For now, I’m at a cavernous warehouse at the dockyards, sorting through wood that was salvaged from old homes. The organization who is supporting our work here, Chishima Foundation, has given us free reign to use any of the materials here for building The Branch and I’m going to take every chance to use that opportunity. 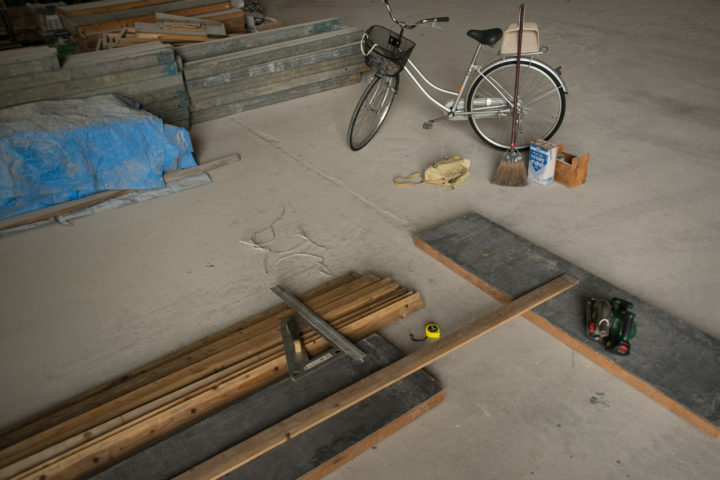 Generally, I’ve preferred the feeling and accuracy of a traditional Japanese hand saw, but when cutting large amounts of wood (the photo above is from cutting floor boards) I’ve used a little battery powered circular saw. Very handy. 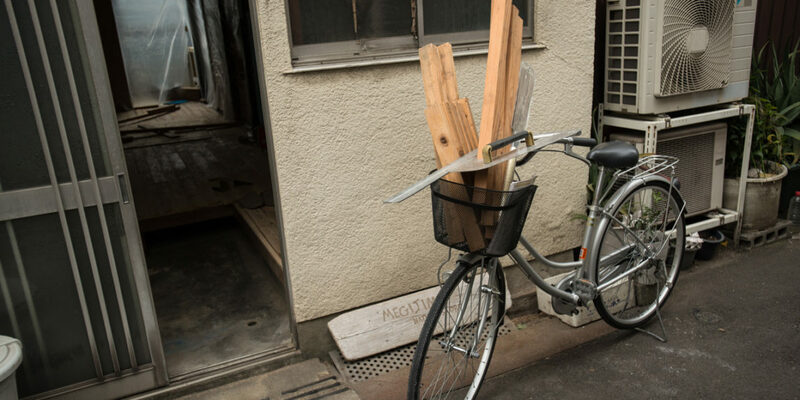 After cutting the relatively small amount of wood needed for the table, I toss the wood into the bike basket and take it home to assemble. In the states, I imagine the scene above might look funny. Here in Osaka, nobody blinks an eye at it. People transport nearly everything by bike in this neighborhood. It’s common to see a mom and two kids on one bike, the mail is delivered by bike (often with a cart in tow), the gas line installation man comes on bike, and grandmothers tootle off to the market on bike. It’s a lovely feeling, to be able to move about with the crisp breeze at your back (even if it’s a bit difficult when the same wind is in your face), and to do it under the power of your own legs and arms, rather than the power of a steel block exploding the hundred-million-year-old remains of plankton and dinosaurs. Back at the house, cutting finished, the process of putting together the table is actually far less frustrating than some IKEA tables I’ve put together in previous lives. The result, even if lacking in physical perfection, is far more satisfying. Like this, The Branch is slowly taking form here in Osaka. Day by day I wake up, and make progress on some piece or another, with a goal to make everything here by hand, and to buy as little mass-produced objects as possible. 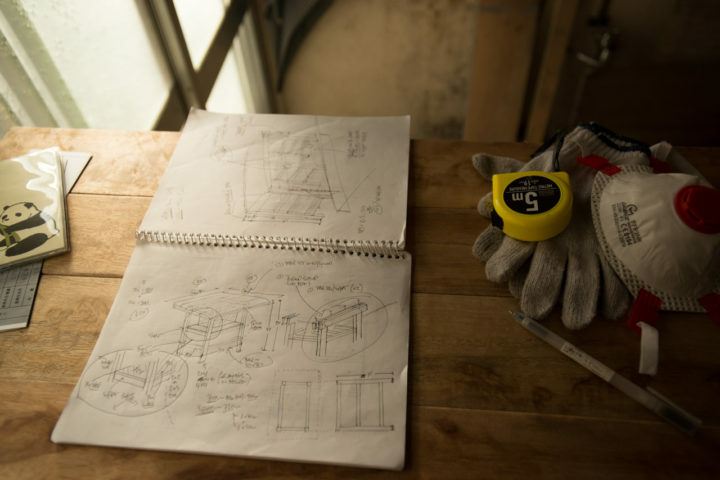 The Branch will be a gallery and community space, a place for learning, growing, and sharing time together. At its roots, it will be a space to foster re-connection of our daily lives with the larger nature that we are a part of, and to use this connection, this creative energy, to build a more equitable future. A more plausible future. As a physical structure, Suhee and I both want The Branch to be a reflection of our hands and minds, and to echo the Japanese mindset of shin zen bi (真善美) which we’ve been so deeply influenced by in our work and studies here; the term translates roughly to “truth, goodness, and beauty”. So from us to you, here’s to a 2018 filled with truth, goodness, and beauty. Hope to see you on the road somewhere, or for a visit to us in Osaka.